Frenchy & the Punk Return to the Symposium! Our Main Full Set will be Saturday Night @ 10pm But we'll also be doing an Acoustic Set Sunday afternoon! Frenchy and the Punk/Guitarmy of One Acoustic Set 2:30pm! 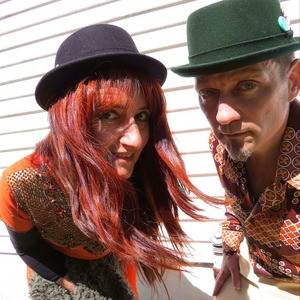 Frenchy and the Punk is an Internationally touring duo based in the Hudson-Valley of New York. Formed by bi-lingual French-born singer Samantha Stephenson and Punk veteran and live looping guitarist Scott Helland who was a founding member and bassist of Deep Wound with J Mascis and Lou Barlow (now of Dinosaur jr). Their sound is an eclectic mix of acoustic, alternative and post-punk with elements of cabaret & folk rock. Helland's signature rhythmic and melodic guitar looping style creates a driving and expansive sonic landscape that perfectly blends with Stephenson's powerful Siouxsie-esque vocals and percussion. They were named one of the ''Top 25 duos in America' by Yahoo music and have performed all across the U.S. and in Europe. Their show is a carnival of two that will take you from the Moulin Rouge to CBGBs and back again. A rollicking cabaret rock show with Taiko meets Rio de Janeiro pounding drum instrumentals.